British luxury sports car maker Aston Martin celebrates 100 years of making luxury British sports cars on 15th January 2013 and To celebrate 100 years of Aston Martin, the oldest surviving Aston Martin, a 1921 A3 prototype (the third Aston Martin ever built), is being displayed alongside the company’s latest car, the Vanquish, at the business’s original home in Henniker Mews, Chelsea, London. A commemorative plaque will be unveiled to mark the occasion. The event kicks off a series of celebrations for the brand. The company was officially incorporated January 15 1913 when Lionel Martin and Robert Bamford founded Bamford & Martin Ltd. The company was renamed Aston Martin in recognition of Bamford’s success (in the very first Bamford & Martin cars) at the Aston Clinton Hillclimb near Aston Clinton in Buckinghamshire.c The two had joined forces as Bamford & Martin the previous year and started out selling cars made by Singer from premises in Callow Street and also servicing GWK and Calthorpe vehicles.The first car to be named Aston Martin was created by Martin by fitting a four-cylinder Coventry-Simplex engine to the chassis of a 1908 Isotta-Fraschini and produced their first car in March 1915. However Production was interrupted by the outbreak of World War I, and Martin joined the Admiralty and Bamford the Royal Army Service Corps. All machinery was sold to the Sopwith Aviation Company. After the war, the company was refounded at Abingdon Road, Kensington and a new car designed to carry the Aston-Martin name. Bamford left in 1920. In 1922, Bamford & Martin produced cars to compete in the French Grand Prix, which went on to set world speed and endurance records at Brooklands. Three works Team Cars with 16-valve twin cam engines were built for racing and record breaking. The company went bankrupt in 1924 and was bought by Lady Charnwood, who put her son John Benson on the board. The company failed again in 1925 and the factory closed in 1926, with Lionel Martin leaving.Later that year, Bill Renwick, Augustus (Bert) Bertelli and investors which included Lady Charnwood took control of the company. They renamed it Aston Martin Motors and moved it to the former Whitehead Aircraft Limited works in Feltham. Between 1926 and 1937 Bertelli was both technical director and designer of all new Aston Martins, since known as “Bertelli cars”. They included the 1½-litre “T-type”, “International”, “Le Mans”, “MKII” and its racing derivative, the “Ulster”, and the 2-litre 15/98 and its racing derivative, the “Speed Model”. Most were open two-seater sports cars bodied by Bert Bertelli’s brother Enrico (Harry), with a small number of long-chassis four-seater tourers, dropheads and saloons also produced. In 1947, David Brown Limited bought the company under the leadership of managing director Sir David Brown—its “post-war saviour”. The company also acquired Lagonda that year for its 2.6-litre W. O. Bentley-designed engine. Both companies shared resources and workshops, birthing the classic “DB” series of cars. 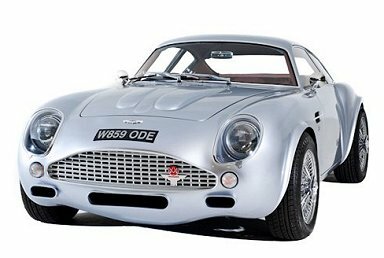 In 1950, the company announced the DB2, followed by the DB2/4 in 1953, the DB2/4 MkII in 1955, the DB Mark III in 1957 and the Italian-styled 3.7 L DB4 in 1958.While these models help Aston Martin establish a good racing pedigree, the DB4 stood out and yielded the famous DB5 in 1963. The company stayed true to its emerging “grand touring” style with the DB6 (1965–70), and DBS (1967–1972).The six-cylinder engines of these cars from 1954 up to 1965 were designed by Tadek Marek. Sadly The Aston Martin company was often financially troubled and In 1972, Aston Martin was sold to Company Developments, a Birmingham-based consortium chaired by William Willson, MBE and was resold in 1975 by its receiver following a further bankruptcy to North American businessmen Peter Sprague and George Minden for £1.05 million.A successful turn-around strategy led to the recruitment of 360 new employees and, by 1977, a trading profit of £750,000. 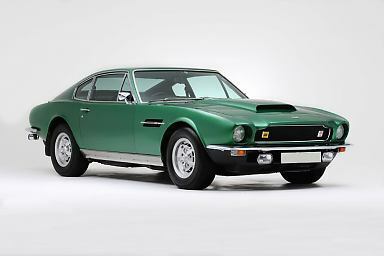 The new owners pushed the company into modernising its line, producing the V8 Vantage in 1977, the convertible Volante in 1978, and the one-off William Towns-styled Bulldog in 1980. Towns also styled the futuristic new Lagonda saloon, based on the V8 model. In 1980 Aston-Martin sought to buy MG, planning to design a new model and offering their take on an updated 1981 model MGB. The acquisition never developed, as the company was badly hit by the economic contraction of the early 1980s. Worldwide sales shrank to three cars per week, prompting chairman Alan Curtis, Sprague, and Minden to consider shutting down production to concentrate on service and restoration. At this point Curtis attended the 1980 Pace sponsored Stirling Moss benefit day at Brands Hatch, and met fellow Farnham resident Victor Gauntlett, who bought a stake in Aston Martin and became as joint 50/50 owners at the beginning of 1981, with Gauntlett as executive chairman. Gauntlett also led the sales team. after some development and publicity when agondabecame the world’s fastest 4-seater production car, was able to sell the Aston Martin Lagonda in Oman, Kuwait, and Qatar.In 1982 Aston Martin was granted a Royal Warrant of Appointment by the Prince of Wales. Understanding that it would take some time to develop new Aston Martin products, they created an engineering service subsidiary Tickford to develop automotive products for other companies included a Tickford Austin Metro (WTF!?) a Tickford Ford Capri. Pace continued sponsoring racing events, and now sponsored all Aston Martin Owners Club events, taking a Tickford-engined Nimrod Group C car up to third in the Manufacturers Championship in both 1982 and 1983 and also finishing seventh in the 1982 24 Hours of Le Mans race. Gauntlett bought a stake in Italian styling house Zagato, and resurrected its collaboration with Aston Martin and In 1986 he also negotiated the return of fictional British secret agent James Bond to Aston Martin. Cubby Broccoli had chosen to recast the character using actor Timothy Dalton, in an attempt to re-root the Bond-brand back to a more Sean Connery-like feel in The Living Daylights.Ford took a share holding in September 1987 & In 1988, having produced some 5,000 cars in 20 years, a revived economy and successful sales of limited edition Vantage, and 52 Volante Zagato coupes at £86,000 each; the company finally retired the ancient V8 and introduced the Virage range—the first new Aston launched in 20 years. Gauntlett’s racing interests took Aston back into sports car racing in 1989 with limited European success. the new Aston Martin Volante model was launched in 1990, and Ford took full control of Aston Martin. In 1992, the Vantage version was announced, and the following year the company renewed the DB range by announcing the DB7 range, which was boosted by the addition of V12 Vantage models in 1999 In 1994, Ford opened a new factory at Banbury Road in Bloxham.In 2001 the company introduced the V12-engined Aston Martin Vanquish At the North American International Auto Show in Detroit, Michigan in 2003, Aston Martin also introduced the AMV8 Vantage concept car. Expected to have few changes before its introduction in 2005, the Vantage brought back the classic V8 engine to allow the company to compete in a larger market. Also introduced in 2003 was the DB9 coupé, which replaced the ten-year-old DB7, A convertible version of the DB9, the DB9 Volante, was introduced at the 2004 Detroit Auto Show.In December 2003 Aston Martin announced it would return to motor racing in 2005. A new division was created, called Aston Martin Racing, which became responsible, together with Prodrive, for the design, development, and management of the DBR9 program. The DBR9 competes in the GT class in sports car races, including the world-famous 24 Hours of Le Mans. In 2007, a consortium led by Prodrive chairman David Richards purchased Aston Martin, although Prodrive had no financial involvement in the deal Ford also kept a stake in the company.To demonstrate the V8 Vantage’s durability across hazardous terrain and promote the car in China, the first east-west crossing of the Asian Highway was undertaken between June and August 2007. A pair of Britons drove 12,089 km (7,512 miles) from Tokyo to Istanbul before joining the European motorway network for another 3,259 km (2,025 miles) to London. The promotion was so successful the company opened dealerships in Shanghai and Beijing. In 2007, the Newport Pagnell plant rolled out the last of nearly 13,000 cars made there since 1955, and The Tickford Street facility was converted to Aston Martin’s service and restoration department.In 2008, Aston Martin announced the revival of the Lagonda marque, and four-door Aston Martin Rapide began production in 2012, and The company’s current line-up includes the Vantage, DB9, Rapide and Vanquish. Best known for his role in the advancement of civil rights using nonviolent civil disobedience, the American clergyman, activist, and prominent leader in the African-American Civil Rights Movement. Born on January 15, 1929, in Atlanta, Georgia he grew up in Atlanta & attended Booker T. Washington High School, where he skipped both ninth and twelfth grade and entered Morehouse College at age fifteen without formally graduating from high school. In 1948, he graduated from Morehouse with a Bachelor of Arts degree in sociology, and enrolled in Crozer Theological Seminary in Chester, Pennsylvania, from which he graduated with a Bachelor of Divinity degree in 1951. King became pastor of the Dexter Avenue Baptist Church in Montgomery, Alabama, when he was twenty-five years old, in 1954. King then began doctoral studies in systematic theology at Boston University and got his Doctor of Philosophy on June 5, 1955, with a dissertation on “A Comparison of the Conceptions of God in the Thinking of Paul Tillich and Henry Nelson Wieman”. Civil rights leader, theologian, and educator Howard Thurman was an early influence on King & mentored the young King and his friends. Thurman’s missionary work had taken him abroad where he had met and conferred with Mahatma Gandhi. While a student at Boston University, King often visited Thurman, who was the dean of Marsh Chapel.With assistance from the Quaker group the American Friends Service Committee, and inspired by Gandhi’s success with non-violent activism, King visited Gandhi’s birthplace in India in 1959.The trip to India affected King in a profound way, deepening his understanding of non-violent resistance and his commitment to America’s struggle for civil rights. African American civil rights activist Bayard Rustin had studied Gandhi’s teachings. Rustin counseled King in the principles of non-violence. In March 1955, a fifteen-year-old school girl in Montgomery, Claudette Colvin, refused to give up her bus seat to a white man in compliance with the Jim Crow laws. King was on the committee from the Birmingham African-American community that looked into the case; because Colvin was pregnant and unmarried, E.D. Nixon and Clifford Durr decided to wait for a better case to pursue. On December 1, 1955, Rosa Parks was arrested for refusing to give up her seat. The Montgomery Bus Boycott, urged and planned by Nixon and led by King, soon followed. The boycott lasted for 385 days, and the situation became so tense that King’s house was bombed. King was arrested during this campaign, which ended with a United States District Court ruling in Browder v. Gayle that ended racial segregation on all Montgomery public buses. In 1957, King, Ralph Abernathy, and other civil rights activists founded the Southern Christian Leadership Conference (SCLC). The group was created to harness the moral authority and organizing power of black churches to conduct non-violent protests in the service of civil rights reform. As the leader of the SCLC, King maintained a policy of not publicly endorsing a U.S. political party or candidate: “I feel someone must remain in the position of non-alignment, so that he can look objectively at both parties and be the conscience of both—not the servant or master of either.” He also expressed a view that black Americans, as well as other disadvantaged Americans, should be compensated for historical wrongs. In one interview he said that granting black Americans only equality could not realistically close the economic gap between them and whites. On September 20, 1958, while signing copies of his book Stride Toward Freedom King was stabbed in the chest with a letter opener by Izola Curry, a deranged black woman, and narrowly escaped death. King found Gandhi’s nonviolent techniques useful to change the civil rights laws implemented in Alabama & applied non-violent philosophy to the protests organized by the SCLC believing that organized, nonviolent protest against the system of southern segregation would lead to extensive media coverage of the struggle for black equality and voting rights. Journalistic accounts and televised footage of the daily deprivation and indignities suffered by southern blacks, and of segregationist violence and harassment of civil rights workers and marchers, produced a wave of sympathetic public opinion that convinced the majority of Americans that the Civil Rights Movement was the most important issue in American politics in the early 1960s. King organized and led marches for blacks’ right to vote, desegregation, labour rights and other basic civil rights. Most of these rights were successfully enacted into the law of the United States with the passage of the Civil Rights Act of 1964 and the 1965 Voting Rights Act. The Albany Movement was formed in Albany, Georgia & mobilized thousands of citizens for a broad-front nonviolent attack on every aspect of segregation within the city and attracted nationwide attention. In April 1963, the SCLC began a campaign against racial segregation and economic injustice in Birmingham, Alabama. The campaign used nonviolent but intentionally confrontational tactics, developed in part by Rev. Wyatt Tee Walker. Black people in Birmingham, organizing with the SCLC, occupied public spaces with marches and sit-ins, openly violating laws they considered unfair. King and the SCLC were also driving forces behind intense demonstrations in St. Augustine, Florida, in 1964.and marched nightly through the city suffering violent attacks from white supremacists. Hundreds of the marchers were arrested and jailed. In December 1964, King and the SCLC joined forces with the Student Nonviolent Coordinating Committee (SNCC) in Selma, Alabama to secure voter registration. This led to A local judge issuing an injunction that barred any gathering of 3 or more people affiliated with the SNCC, SCLC, DCVL, or any of 41 named civil rights leaders. This injunction temporarily halted civil rights activity until King defied it by speaking at Brown Chapel on January 2, 1965. King was also among the leaders of the so-called “Big Six” civil rights organizations who were instrumental in the organization of the March on Washington for Jobs and Freedom, which took place on August 28, 1963. The other leaders and organizations comprising the Big Six were Roy Wilkins from the National Association for the Advancement of Colored People; Whitney Young, National Urban League; A. Philip Randolph, Brotherhood of Sleeping Car Porters; John Lewis, SNCC; and James L. Farmer, Jr. of the Congress of Racial Equality. The march originally was conceived as an event to dramatize the desperate condition of blacks in the southern U.S. and an opportunity to place organizers’ concerns and grievances squarely before the seat of power in the nation’s capital. Organizers intended to denounce the federal government for its failure to safeguard the civil rights and physical safety of civil rights workers and blacks. The March made specific demands: an end to racial segregation in public schools; meaningful civil rights legislation, including a law prohibiting racial discrimination in employment; protection of civil rights workers from police brutality; a $2 minimum wage for all workers; and self-government for Washington, D.C.then governed by congressional committee. King also delivered a 17-minute speech, later known as “I Have a Dream”. In the speech’s most famous passage–in which he departed from his prepared text, possibly at the prompting of Mahalia Jackson, who shouted behind him, “Tell them about the dream! Despite tensions, the march was a resounding success and More than a quarter of a million people of diverse ethnicities attended the event, sprawling from the steps of the Lincoln Memorial onto the National Mall and around the reflecting pool. At the time, it was the largest gathering of protesters in Washington, D.C.’s history. Despite this, some civil rights activists felt it presented an inaccurate, sanitized pageant of racial harmony; Malcolm X called it the “Farce on Washington,” and the Nation of Islam forbade its members from attending the march.Throughout his participation in the civil rights movement, King was criticized by many other groups. This included opposition by more militant blacks and such prominent critics as Nation of Islam member Malcolm X. Stokely Carmichael was a separatist and disagreed with King’s plea for racial integration because he considered it an insult to a uniquely African-American culture. Omali Yeshitela urged Africans to remember the history of violent European colonization and how power was not secured by Europeans through integration, but by violence and force. King, James Bevel, and the SCLC, in partial collaboration with SNCC, attempted to organize a march from Selma to the state capital of Montgomery, for March 7, 1965. The first attempt to march on March 7 was aborted because of mob and police violence against the demonstrators. This day has since become known as Bloody Sunday. Bloody Sunday was a major turning point in the effort to gain public support for the Civil Rights Movement, the clearest demonstration up to that time of the dramatic potential of King’s nonviolence strategy. In 1966, after several successes in the South, King and others in the civil rights organizations tried to spread the movement to the North, with Chicago as their first destination. King and Ralph Abernathy, both from the middle class, moved into a building at 1550 S. Hamlin Ave, in the slums of North Lawndale on the West Side of Chicago, as an educational experience and to demonstrate their support and empathy for the poor. Several larger marches took place in Bogan, Belmont Cragin, Jefferson Park, Evergreen Park (a suburb southwest of Chicago), Gage Park, Marquette Park, and others. When King and his allies returned to the South, they left Jesse Jackson, a seminary student who had previously joined the movement in the South, in charge of their organization. Jackson continued their struggle for civil rights by organizing the Operation Breadbasket movement that targeted chain stores that did not deal fairly with blacks. In 1965 King began to publicly express doubts about the Vietnam War. In an April 4, 1967 appearance at the New York City Riverside Church—exactly one year before his death—King delivered a speech titled “Beyond Vietnam”. He spoke strongly against the U.S.’s role in the war. He also opposed the War because it took money and resources that could have been spent on social welfare at home. King’s opposition cost him significant support among white allies, including President Johnson, union leaders and powerful publishers. King began to speak of the need for fundamental changes in the political and economic life of the nation, and more frequently expressed his opposition to the war and his desire to see a redistribution of resources to correct racial and economic injustice. King also spoke at an anti-war demonstration where he also brought up issues of civil rights and the draft and On January 13, 1968, the day after President Johnson’s State of the Union Address, King called for a large march on Washington against “one of history’s most cruel and senseless wars”. In 1968, King and the SCLC organized the “Poor People’s Campaign” to address issues of economic justice. King traveled the country to assemble “a multiracial army of the poor” that would march on Washington to engage in nonviolent civil disobedience at the Capitol until Congress created an ‘economic bill of rights’ for poor Americans. The campaign culminated in a march on Washington, D.C., demanding economic aid to the poorest communities of the United States.King and the SCLC called on the government to invest in rebuilding America’s cities. He felt that Congress had shown “hostility to the poor” by spending “military funds with alacrity and generosity”. He contrasted this with the situation faced by poor Americans, claiming that Congress had merely provided “poverty funds with miserliness”. His vision was for change that was more revolutionary than mere reform: he cited systematic flaws of “racism, poverty, militarism and materialism”, and argued that reconstruction of society itself is the real issue to be faced.The Campaign proved controversial even within the civil rights movement. Rustin resigned from the march stating that the goals of the campaign were too broad, the demands unrealizable, and thought that these campaigns would accelerate the backlash and repression on the poor and the black. On March 29, 1968, King went to Memphis, Tennessee, in support of the black sanitary public works employees, represented by AFSCME Local 1733, who had been on strike since March 12 for higher wages and better treatment. In one incident, black street repairmen received pay for two hours when they were sent home because of bad weather, but white employees were paid for the full day. On April 3, King addressed a rally and delivered his “I’ve Been to the Mountaintop” address at Mason Temple, the world headquarters of the Church of God in Christ. King was due to fly to Memphis but had been delayed by a bomb threat against his plane. While staying in Memphis King was booked in room 306 at the Lorraine Motel. Then, at 6:01 p.m. April 4, 1968, a shot rang out as King stood on the motel’s second-floor balcony. After emergency chest surgery, King was pronounced dead at St. Joseph’s Hospital at 7:05 p.m. The assassination led to a nationwide wave of race riots in Washington D.C., Chicago, Baltimore, Louisville, Kansas City, and dozens of other cities. Presidential candidate Robert F. Kennedy was on his way to Indianapolis for a campaign rally when he was informed of King’s death. He gave a short speech to the gathering of supporters informing them of the tragedy and urging them to continue King’s ideal of non-violence.President Lyndon B. Johnson declared April 7 a national day of mourning for the civil rights leader. Vice-President Hubert Humphrey attended King’s funeral on behalf of the President, as there were fears that Johnson’s presence might incite protests and perhaps violence. Two months after King’s death, escaped convict James Earl Ray was captured at London Heathrow Airport while trying to leave the United Kingdom on a false Canadian passport in the name of Ramon George Sneyd on his way to white-ruled Rhodesia. Ray was quickly extradited to Tennessee and charged with King’s murder. He confessed to the assassination on March 10, 1969, though he recanted this confession three days later. On the advice of his attorney Percy Foreman, Ray pled guilty to avoid a trial conviction and thus the possibility of receiving the death penalty. He was sentenced to a 99-year prison term. Ray’s lawyers maintained he was a scapegoat similar to the way that John F. Kennedy assassin Lee Harvey Oswald is seen by conspiracy theorists. One of the claims used to support this assertion is that Ray’s confession was given under pressure, and he had been threatened with the death penalty.Ray was a thief and burglar, but he had no record of committing violent crimes with a weapon. Just days after King’s assassination, Congress passed the Civil Rights Act of 1968. This legislation was seen as a tribute to King’s struggle in his final years to combat residential discrimination in the U.S. Internationally, King was posthumously awarded the Presidential Medal of Freedom in 1977 and Congressional Gold Medal in 2004 and received the Nobel Peace Prize for combating racial inequality through nonviolence. King’s legacy influenced the Black Consciousness Movement and Civil Rights Movement in South Africa. King’s work was cited by and served as an inspiration for South African leader Albert Lutuli, another black Nobel Peace prize winner who fought for racial justice in his country. The day following King’s assassination, school teacher Jane Elliott conducted her first “Blue Eyes/Brown Eyes” exercise with her class of elementary school students in Riceville, Iowa. Her purpose was to help them understand King’s death as it related to racism, something they little understood from having lived in a predominately white community.King’s wife, Coretta Scott King, followed in her husband’s footsteps and was active in matters of social justice and civil rights until her death in 2006. The same year that Martin Luther King was assassinated, she established the King Center in Atlanta, Georgia, dedicated to preserving his legacy and the work of championing nonviolent conflict resolution and tolerance worldwide. Their son, Dexter King, currently serves as the center’s chairman. Daughter Yolanda King, who died in 2007, was a motivational speaker, author and founder of Higher Ground Productions, an organization specializing in diversity training. There are opposing views, even within the King family, of the slain civil rights leader’s religious and political views about gay, lesbian, bisexual and transgender people. King’s widow Coretta said publicly that she believed her husband would have supported gay rights. However, his daughter Bernice believed he would have been opposed to gay marriage. The King Center includes discrimination, and lists homophobia as one of its examples, in its list of “The Triple Evils” that should be opposed.